Energy and the Environment-A Coastal Perspective - Onshore and Offshore Drilling in NC: Should We Be Worried? Onshore and Offshore Drilling in NC: Should We Be Worried? Drilling in N.C. is something that I had never worried about, at least not until this past fall. I am a geology major and while at a meeting in my department I had the opportunity to speak with Dr. Kenneth Taylor, the Chief Geologist of the N.C. Geological Survey. Dr. Taylor had a long talk with me about the natural gas reservoirs that had been found in N.C. and how he believed that these sources could supply N.C. for 40 years. However, to obtain natural gas, hydraulic fracturing would have to be used. I had just learned about hydraulic fracturing (also known as hydrofracking or fracking) in a geography course on energy and was concerned by the idea. Based off of my research, the best places to drill for resources in N..C are off the coast and in basins in the piedmont since these are the areas where there are potential reservoirs with organic material in sedimentary rocks. The majority of the geologic formations in the mountains are made of metamorphic rock and therefore are unlikely to have any organic material left. Something I didn’t know is that North Carolina has been explored for resources for quite some time (since 1925) and 128 petroleum exploration holes have been drilled. At present, there are 14 counties in N.C. that could have natural gas, but the most valuable prospects in N.C. are in Lee, Chatham, Moore, and Durham counties. 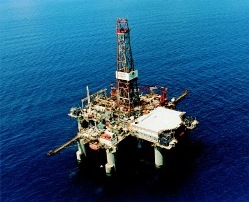 At present, there are no natural gas and oil leases offshore of North Carolina, although the area was leased for exploration in 1990. These leases were dropped in 2001 though after the State denied the companies their right to drill. Since 2008, offshore drilling has begun to be explored again with three areas off the Atlantic coast, including North Carolina and Virginia. On the bright side, the N.C. General Assembly leadership commissioned a study committee in 2009 to examine the effects of off-shore natural gas and oil exploration. This study will be completed this coming spring and will also be examining fracking and its effects. However, recent activity in the N.C. Senate (the Energy Jobs Act Bill) could remove the ban from fracking. This bill was vetoed by Kay Hagan, but was overridden by the Senate and is up for vote again today. The sad thing is that there are so many people who don’t know anything about the energy sources we rely on and how they’re obtained. Let’s hope the N.C. Senate takes advantage of the information they have and makes the best decision they can. Comments Off on Onshore and Offshore Drilling in NC: Should We Be Worried?